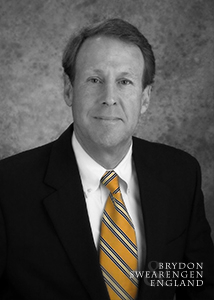 A former Assistant General Counsel for the Missouri Public Service Commission, William “Trip” England practices primarily in the area of public utility regulation including telecommunications law. Since 1991, Trip has been listed in The Best Lawyers in America in the area of Communications Law and Energy Law. Trip is a former Vice Chairman of the Communications Committee of the Section of Public Utility Law, Communications and Transportation Law of the American Bar Association. He is a former president of the Cole County Bar Association and is a co-author of the chapter on the Missouri Public Service Commission in the Missouri Bar’s Administrative Lawdesk book.